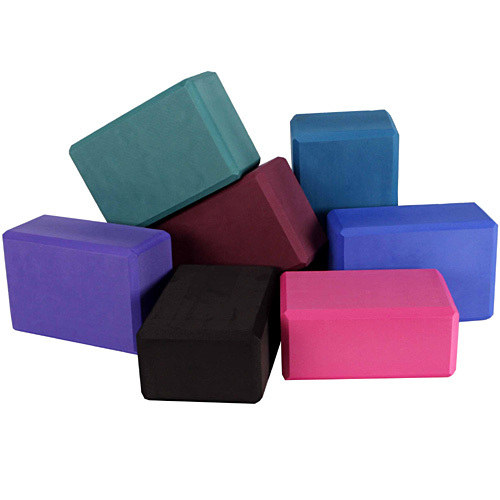 Foam yoga blocks are used by amateur and professional yogis alike! Using a foam block will improve form, alignment, and flexibility. Our 4"" generic foam block is made from sturdy, scratch resistant material that is soft and fun to touch. This is the most common size yoga block and will suit the needs of most yogis. Need a little extra boost? Just flip your block length-wise! With 12 awesome color options, we are sure you can find a block to suit your unique style. Grab a Yoga Accessories foam block to supplement your home practice, or grab a whole boat load for your yoga studio! You'll find that a foam block can provide the stability and lengthening leverage you need to fully extend into your favorite postures. Just place a block under your hand for half moon pose and smile as your instability melts away! Want to brand this block? Our 4 Inch Block is available with custom printing! Looking for a smaller yoga block? Check out our 3" Yoga Block. Looking for a bigger block? Try our 6" SUPERBLOCK. Great product at a great price. Tons of color options so you can easily design a decor that works for your space. Purchased to outfit a yoga room in a condominium. Soft, comfortable, and durable (resistant to scratches and pressure marks). Really helps you get into certain poses and the vibrant color is an added bonus! Great durable blocks to work with + they come in such a great variety of colors. Good price. Definitely will be part of future purchase to expand my yoga practice props. I bought several of these blocks (also in purple and gray) to use with my students at school. The blocks work really well to help modify for poses like half moon. I also use them for fish pose — my students really like that a lot! These blocks are awesome — super good deal! Excellent quality and the price was unbeatable! These block are very sturdy and an excellent buy for the price. We received this product as a promotion, and so far it seems fine. It is slightly denser than other comparably priced blocks I have ordered, so that is a plus. So far, 5 stars. Blocks are a good size for support before going into full backbend.